EMC World 2014 and the sub conference for EMC:s Information Intelligence Group called Momemtum is hours from kicking off here in Las Vegas. In the light of last week’s announcement from Cisco that it is dropping their WebEx Social (formerly Cisco Quad) product and instead partnering with Jive Software make me want to examine this space in relation to EMC Documentum. We are all talking Enterprise Social or Enterprise 2.0 of course and when it comes to Enterprise Content Management systems that is something we like to see as a social layer on top of established technologies to store unstructured information that makes interaction and collaboration more seamless. What is this enterprise social thing then? I would argue that what we need is support for asynchronous or non-realtime collaboration added to the features we can offer enterprise users. However, not only offering that as some separate silo of information often run in the cloud but as an integrated solution (with an on-premise option for some of us) where we can collaborate asynchronously around documents that we already have stored in ECM-systems like EMC Documentum. Why does it matters for enterprise content management? ECM is all about storing unstructured information in a way that provides context around it so it can be used efficiently in our business processes. That context includes metadata based on various taxonomies, security, lifecyles, workflow capabilities, alternative formats but also extracting information from the content that allows for ”discovered metadata”, classification and of course search. To me Enterprise Social is just about adding an additional set of context around information based on people collaborating around it not seldom without any formalized workflow support. That context is then so helpful in providing additional perspectives or views on the information based on what people have thought if it rather than what it is actually containing. What kind of feature are we talking about then? What about synchronous or real-time collaboration? An ability to provide a seamless integration from seeing a comment around a document from a specific user, noticing the green presence icon next to the name and seamlessly launch a text or audio chat is of course powerful an helpful instead of relying in three different applications to do the same (ECM, Social and chat). What have EMC Doumentum done in the social area before then? Quite a lot to be honest but also to some degree to much in terms of not having a coordinated product effort over the years. First of all eRoom was/is a product based on just that, collaboration. It provided a way to set up spaces for collaboration often used for projects. After it was bought an integration effort was made to make eRoom use the same repository technology as the rest of the Documentum stack which made a lot of sense for those wanting to eliminate the information silo. A popular feature in that also included data tables even though their social nature is not that obvious but providing ”basic Excel” on a web page is a useful feature. new way of previewing content inspired by coverflow in iTunes. In addition to that it also feature a new search capability based on Xplore and a nice facetting based on discovered metadata. From a technology standpoint so called Centerstage spaces included document libraries, discussion components which placed in a Spaces cabinet which in other clients looked like folders. Even more powerful these collaboration objects could be set up as a result from a an activity in a process. Finally we are now in the era of the next-generation client called Documentum D2 with an even more modern architecture with configurable workspaces that can be set up differently for different groups of people. It actually includes some social capabilities like being able to view collaborative workspaces created in Centerstage but also doing comments and favorites on pieces of content. Another collaborative feature is support for annotation on/in documents which are even more enhanced if using any of the third party provided viewers that work with Documentum D2. Finally the feature which allows you to subscribe to changes to a document is back again (was available in Webtop/DAM) which actually is a powerful collaboration feature. So there have been a fair set of collaborative features in the Documentum product over the years. The catch is however, that not all are available today in the current set of products. What about Documentum and other provides of social platforms? 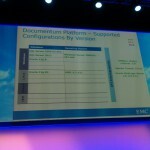 In May 2011 there was an announcement from EMC and Cisco about teaming up around social features by providing an integration between Documentum and what was then called Cisco Quad. In essence it meant being able to connect to documentum to document library sets within Cisco Quad using the CMIS interface. Cisco Quad then provided seamless integration to Cisco’s support for real-time collaboration such as WebEx Meeting and Jabber. Around the same time it was announced that VMWare acquired the microblogging platform called Socialcast which provides an internal activity streams to customers but without features likes wikis and blogs. We have also seen a few official signs of that Socialcast technology is making its way into the platform and even seen prototypes of Socialcast-power activity streams within Documentum D2. CMS-wire have in fact publicly requested Chairman Joe Tucci to give Socialcast to the Information Intelligence Group which has been discussed again this weekend in a new article from CMS-Wire. Finally it is worth mentioning that EMC the company is using social software from Jive Software to power its own socially-enables community called ECN which means that experience around that product is within EMC, although not necessarily in the Information Intelligence Group where Documentum belong. The hard part is to be able to both surface Documentum content in Jive and provide social interface components in D2 and xCP. 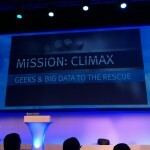 What is IBM and Alfresco doing then? I spent last week at IBM Impact 2014 and had the opportunity of speaking with some executives around both their Enterprise Content Management software based on IBM Filenet and their collaboration software IBM Connections and IBM Sametime. They currently provide an integration between both their Content Navigator product and Case Manager where social features like comments can be made on content stored in Filenet. There is also presence and chat integration from Content Navigator to Sametime as well as a possibility to go to Sametime Meetings directly from Connections. A lot of the integration is based on CMIS but there is of course possible to use REST-integration for all these three clients. I guess that is also the interesting observation that even if the integration exists there are still three (or four if you count Case Manager) web interfaces for ECM, Social and Real-time collaboration. Since Cisco is now abandoning WebEx Social an integration with a product like IBM Connections (and therefore also IBM Sametime) make a lot of sense if this thing with VMWare Socialcast does not plays off. All these have REST-interfaces which would make integration feasible. I guess I have to mention Alfresco as well here since it has a tendency to surface as an alternative to Documentum and Filenet from time to time. Alfresco is sometime marketed as Social ECM and the community edition offer a basic set of social features on top of the documents. You can favorite, like and comment (without notifications) and there is an activity stream to let you see what has happened in sites you are a member of. In addition to that each site contains support for discussions, wikis, bookmarks and data lists (similar to data tables). Finally you can do ”Dropbox”-like sharing of content but their integration with Desktop and mobile apps are nowhere near where EMC has come with syncplicity. A decent benchmark for social features in ECM but also not a dedicated Social interface like Socialcast, WebEx Social, Connections and Jive. Also no integration with enterprise real-time collaboration tools like WebEx, Lync and Sametime. Still Alfresco seem like things you use if you can leverage other web/cloud-based services. Found these notes from EMC World 2013 and decided to publish them even though the next EMC World is coming up soon. This session was presented by Sunil Sharma, Principal Product Manager D2. D2 4.1 has been released. Talks about the move away from coding towards configuration. Move from efforts share of 20% configuration and 80% development to the opposite. Collaboration (on content using discussions on content and native annotation capabilities in MS Word. Distribution is similar to quickflow from Webtop/DAM. Features that I like are managing relationships, mass update of properties, saved search, faceted search, virtual document editing and document comparison. Custom widgets can be developed. 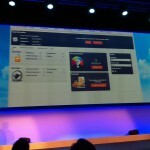 Listeners can be developed by customers around widgets provided by EMC. Make it possible to ”catch” certain criteria of what is happening in an EMC Widget. Example of custom PDF viewer where clicking on a Word-document shows the PDF rendition in a viewver. Also an example of showing diagrams and pie charts based on data in the repository such as values of certain attributes. Cool example of creating a virtual folder structure based on attributes. Also example with maps where clicking on a document repositions the map and where searching for a city in the map updates the list of documents based on selected geolocation. Possible to leverage the D2 rules engine in other application through D2FS API. Enterprise configuration (new abilities to secure a configuration from unwanted changes and preserving configurations using version control. Simplified content creation process to be able to skip certain parts of the import process if you have a default configuration for each step or silent it. Solution Platform Harmonization – D2 is the UI for content-centric applications. The idea is to use xCP to compose widgets and use them in D2. The page in xCP can be exposed in D2 either as a widget or a workspace. 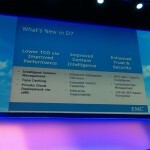 Collaboration (D2 will replace Centerstage and eRoom). REST mimics the way users use the Internet. Everything is a resource and it is stateless – the server does not need to know where you come from and where you are going. REST Services are programming/language/framework independent. Any language which has an HTTP framework. No SDK required. If it is stateless it is much easier to scale. No session to replicated since the state is not persisted on the server side. No SDK also means that there are no clients to upgrade so also scalability from an IT management perspective. 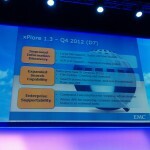 Acknowledges that EMC IIG have talked about that for a while but now they are ready to deliver. Technology Preview 1 for Core Platform announced on March 2013. REST also coming for Captiva and D2 so D2FS is going away in the long run. The concept is to automatically generated (almost everything will get a REST interface). Spring is the biggest framework in the Java world. Still deploy REST as w WAR-file just like Webtop or Media Workspace. API is stateless for HA and deployment flexibility. Previously it was bound to a host name. Simple JSON and XML representations. Pushing for SAML later on. Default response is XML but butting objects.json? will switch to JSON representation. The REST War-file is designed to live outside the content server. Important if you want to place it in another part of the DMZ to allow mobile access. DQL is right now read-only operations. Done using HTTP GET. Here we go again. 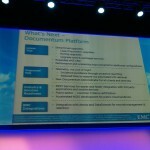 A discussion around rich media and what it means for the EMC Documentum platform. ”Poor” media such as PDF and Office-documents have their natural place and support in the Documentum platform. However, I realize that one of the arguments that I often use to describe the differences between Documentum and other ECM-platforms is the breadth of file formats it supports. Especially compared to Sharepoint which due to its close ties to MS Office is mainly focused on these file formats and everything else is second class citizen. The question is to what degree my claims are accurate in practice. Is Documentum the platform that handles ”all” types of content or is that just something that is true on paper. Let´s examine what rich media support really is and what it could be. Core architecture support for file extensions, large file sizes (over the magic 2 GB limit) and some streaming architecture. Transformation/rendition capabilities for image and video/audio file formats. User interface that supports image, video and audio content (viewer, storyboards, thumbnails, gallery views and metadata). Tools to annotate and provide additional context around image/video/audio content. The obvious question here is where you draw the line between features supported by your ECM-platform in the browser and what you expect people to do in Adobe Photoshop, Final Cut Pro X and Adobe Audition? The reason to put it on the ECM Web client is to leverage the computing power in the server, reduce need for desktop installs and possibly make it easier to perform basic rich media operations without having to learn Photoshop for instance. Currently some of this is supported in the old DAM application but it is slow and looks old today. Media Workspace actually provide quite decent functionality along this front but is basically killed off due to the demise of Flash. Media Workspace has great support for nr 4 in my list and some organization feature from nr 5 through the support for collections. EXIF metadata is extracted and viewable in the Media Workspace client as well as some video metadata. The new clients are not there yet though. The inline viewer for xCP does not support video at this time but support images. The new HTML5 viewer will only support PDF initially it seems. D2 has the possibility to support the Brava viewer which supports viewing videos in MP4, MOV and FLV formats. There is some video annotation support which allows you to annotate a specific frame in the video which is stored back as a dm_note object. So there is some and I repeat some rich media support in there but it is spotty and not a coordinated approach on the client side. This does no reflect the situation server side though where there are quite capable modules available in the underlying platform. That is especially true for the Audio/video transformation services which is currently based on a broadcast-level tool called Telestream Flipfactory which really can do everything you need to do on audio and video. From Documentum D7 AVTS is instead based on FFMPEG and MTS is based on ImageMagick. However, that is capable of – few of those features are actually exposed or configured. Basically customers of AVTS are sitting on an unpolished diamond, possibly without knowing it. To me it is now a mismatch between what the platform can offer and what user’s are able to do when it comes to rich media. What about the use case then, is there a business requirement for this? To start with the internet giants Facebook, Flickr, Youtube and Instagram has showed us how easy you can do rich media content management. User’s have adopted it and they have learned how to do it. However, traditionally rich media in the ECM or Digital Asset Management space has been focused on ”creative content creation” which means graphical artists, fotographers and their needs. Often in an ad agency context where it has been about creative content workflows that need to be managed and in the end billed properly. The Disney use case here at Momentum 13 is a good example. An application that supports their business-to-business operation of selling and licensing creative content to companies. Fairly advanced use cases in general. But what about the more casual or ”light” DAM which Facebook image management represent. Isn’t there a a use case for that? There must be organisations that need to organize rich media that is created internally. I can think of real estate agents, insurance companies, car dealers just to name a few. In the military we are handing out digital cameras left and right and there is a big need to be able to make something useful of this in the long run. Isn’t there a market opportunity for EMC here to provide DAM light on a true (already rich media-enabled) ECM platform to allow customers to manage rich media in line with everything else instead of buying a siloed product for just photo management? Jeroen going over the colored architecture image again. I think the box ”content/xml” is new. DFC is Java and DFS is SOAP. Now REST is coming. Syncplicity will find its way into different parts of the stack as a technology, not only a product. IIG is now shooting for the hybrid cloud solution where EMC sees growth. What was called NGIS but it has been renamed (by marketing) to ”SaaS solution”. Solutions that cross the boundries of the enterprise is the way EMC sees the world. First integration with VIPR has been made on the SaaS solution but we can expect that coming to the Documentum platform as well. Syncplicity can be the underpinning for the content flow between on-premise and SaaS solutions. Enterprise Archiving Solutions (EAS). Promoted to be a full blown product but came from professional services. 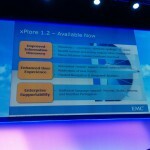 Based on xDB to provide a single archiving solution for both structured and unstructured content. Main use case is systems being decommissioned. Very expensive to keep these systems around for compliance reasons. EAS can maintain access to a lower cost. Also store inactive data from the production system in EAS and offload it. Adopting OAIS Standard Framework from Open Archival Information Systems (ISO). Simulated 50 banks and 10 years of data. Transformed data in archiving buckets/packages. xDB stored each of these in a physical segment translating into a database file. Impressive scalability even with 100 000 segments. Argues that XML is a very future-proof format that easily can be readable in the future. Came into being when they started creating EMC OnDemand for Documentum. Needed a smarter way to deploy the platform. 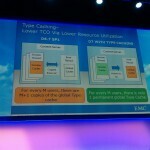 tcServer is the optimized for xMS. CLI tools that can be used with Maven or similar tools.xMS server also has a catalog that manages users etc. Possible to utilize vMotion to spin up new VMs when workloads are heavy. 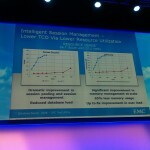 The performance improvements mentioned before was done using a DFC Test Utility that probably is available to customers. xCP is more type intensive. Say from 50 to 500 types. Hence type caching optimizations. Core Documentum products ships with RSA certified algorithms. Optional integration with RSA Data Protection Manager fir Remote Key Management. Encrypted content and electronic signatures can be verified using this. In addition to that they are investing heavily into IRM. Seeing more requests for SAML on the Content Server side. The main forward strategy for IIG is REST. They are embracing Spring technology for REST such as Spring MVC REST and the Spring Marshalling Framework. Now it is a pure REST implementation (which the preview wasn’t) with JSON and XML representation. Michael doing demo of REST using XCode on a Mac for an iPhone application. Surprisingly easy to develop – took 1 hour. Faster than DFS and DFC. Connectors available for Atmos and Isilon storage but also for Documentum. Currently only push but push is on the roadmap. Syncplicity is the main technology to control how content leaves and enters the enterprise which includes security and encryption. Michael highlights the Dormant States in D7 which allow applying upgrades without shutting the system down. Opens up for vApp Cloning and taking snapshots since the database in a nice mode with no changes possible. They have a long term approach to ease upgrading and Dormant state is one of them. Reduce the cost to move to new versions. It will block audit trails as well so if there are audits happening on read operations that will not work. Documentum D2 is not using UCF – it is a Java applet. Presented by Patrick Walsh, Principle Product Manager Documentum Platform and Aaron Aubrecht VP Product Management & XPO, IIG. This session will focus on the core platform. Last year they tried to fit in everything and ran 20 min over time and half of the slides left unshown. 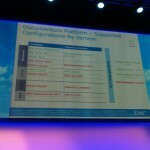 Talks about the need for IT to deliver business capability not just applying patching to Documentum. My personal reflection is that many IT-shops do not have a business perspective today. Maybe because they have budget efficiency requirements on them making reducing costs the main priority. Few people in the room had actually upgraded to Documentum 7 and that is a problem that to much modern capability is left unused in many organisations. That is why the separation of upgrades to platform and clients is pushed now. So repeating the same message of what is new in D7. 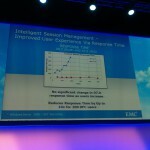 Performance improvements due to intelligent session management (ISM) and type caching. ISM reduces memory usage up to 65 % by multiplexing communications between application server, content server and the database. Similar memory usage improvements with type caching. Talks about xMS with automated deployment of a new D7 and xCP 2.0 stack for private VMWare private cloud environment. Deployment down to hours via XML-based blueprints describing the deployment parameters. Includes embedded deployment and configuration of Hyperic agents. We have yet to try this but I really hope that the blueprints represent a best practice starting point to develop our own blueprints. Also improved content intelligence with xPlore 1.3. Includes large file support through partial indexing, content classification inline, added date-range search capability & metadata and of course the recommendation engine. It also features ad scriptable command line interface for automation and you can control xPlore from third party tools via Admin UI. Crypto algorithms switched from DDS to AES which seem about time! Leads also to improved performance. Finally the EMC Syncplicity Connector for Documentum which allows for external sharing of information with security enforced at the endpoint. Will come in Q4 2013. Full minor version. RHEL 6.x, x64 in D7.1, Native 64-bit, multithreaded architecture- Intelligence Session Management & Type Caching. Smarter deployments (Automatic discovery of services and componetns for existing environments). Orchestration for externally managed VMs or physical hosts. Clustering support with HA and load balancing. Web administration UI is coming with automated software patching. Enhanced trust and security. Continue to harden Documentum. Stronger authentication security. Non-anonymous SSL. Great to see CAS support coming. xPlore 1.4 is coming with faster response times for large result sets, improved diagnostics and automation for easier deployment. Talks about strategy forwards. Wants to reduce the number of configurations to test code against. Expect a narrower set of combinations of operating systems, app servers and databases. Talks about the possibility to move upgrades for platform and clients separately. The Enterprise Migration Appliance (EMA) is a response to the fact that migrations are complex projects. Happens not on the API level but on the database level. Traditional API-based methods are It is a virtual appliance with a complete server running on vSphere/ESXi environment. Also promotes migration solutions from both fme and euroscript. 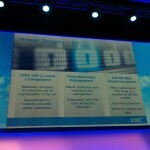 There is an EMC Documentum 7.0 Rapid Success Program. To register go to: http://bit.ly/D70RSP by May 17, 2013. The conference is now up to speed I think. It started off for real on Monday afternoon. 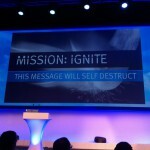 Some sneak peaks poured out of the Global Partner Summit over Twitter though. 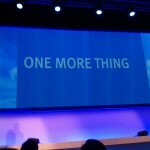 One such thing was the rebrandning of all the partner program into something called EMC Business Partner. That means all Velocity partners and of course IIG Partners in no longer something seen in the branding. I am a bit afraid of IIG products will drown in the storage sea because there are so many more partners just focusing on storage. That will make hard to find those skilled in Documentum, Captiva and Document Sciences. I hope there will be a way to gather IIG-capable EMC Business Partners in some kind of online summary. I think the Alfresco partner directory is a good way to do it. Presented by David Mennie, Patrick Walsh and Peggy Ringhausen. They choose to highlight three areas of innovation: Documentum xCP 2.0, Captiva 7 and Documentum D2 4.1. One good thing about the new xCP is that it includes a viewer inside the GUI to be able to view documents along with all the context around it. By the way it is one of the things I like with Alfresco Share. It is an important way to reducing user mouse clicks. Saves time and effort. All the developer tools from earlier releases have now been harmonized into one single tool called xCP Designer. Another aspect that is important is to be able to create a data-driven UI which is important if process orientation is not the best way to approach business support. 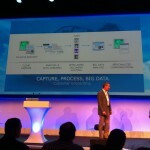 That data can be internal or external from things like Greenplum. David also hightlighted the new autolearning feature in Captiva 7. Over to performance the same diagrams that we have seen before where show. Really drastic performance improvements which of course mean that the old versions now look very slow. The benchmarks were made with Windows 2008 Server allowing for a multi-threaded environment. New security features include FIPS 140-2 Level 1 compliance, Centralized Key Management and 128-bit AES encruption. When it comes to D2 4.1 I think it is becoming more and more ”feature enough” (not complete) to include many of the advanced things you expect and is existing in Webtop-applications today. 4.1 also include Syncplicity integration to allow external sharing with people who does not have access to Documentum D2. Right now it is folder-based and one way (push). Pull is coming in 2014. When it comes to upgrades the installer now supports version 6.5 and newer to upgrade to D7. The upgrade path include options to move to new clients without having to upgrade to D7 directly. 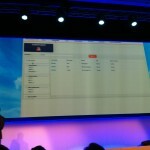 Support for DAM (including Media Workspace) and Centerstage 1.2 is coming in 2013. Disney uses to Documentum to power their Business-to-Business license operations for all their major brands. Theey use Content Server, DAM(top) and Media Transformation Services. It uses a 100% custom Flex application for search & discovery, organisation and delivery of content. The delivery and cache solution is also 100% custom. To ingest content they have also developed a 100% custom Flex/Air application. Their CTS are highly customized for DMC’s custom thumbnail, preview renditions and CMYK compability (for print I guess). All in all Documentum provids security and workflow around the creative assets (but only 2D art work). It took Disney a couple of years before they realized that they needed some additional support from EMC, I guess also because they seemed to have a fairly small team in-house. They have a Technical Account Manager (TAM) assigned to them which conducts weekly meetings with Disney together with the Designated Support Engineer (DSE). The DSE also has access to a replica of the Disney system at EMC. Internally Disney uses four different systems from dev, verification, production copy and production. Here again in Las Vegas for the biggest conference event of the year for. So it has been for quite a few years. Started coming here in 2007 and that was a VERY different conference than it is now. 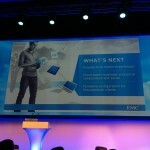 Both EMC World in general and Momentum in particular. Back then it wasn’t even called Momentum, I guess in an effort to harmonize all things EMC under one brand. It did not work out that well for us interested in Documentum. So they listened and now the Momentum area with lounge and our small ribbons on the name tag seem to be a stable concept. Now I am seated in the Blogger’s space. A spacious environment for those of us who want to have a water hole to put down our thoughts on blogs and social media. New this year is ”laptop bars” with power outlets and internet on ethernet cables. Also new is the EMC Elect space for those of us belonging to that club. Monday has become a little bit of a slow starter day, maybe because the first part of the day is devoted to the partner conference. For me the main sessions starts in the afternoon. Looking forwards to the EMC Elect meeting with Jeroen van Rotterdam and the rest of the engineering lead of IIG this afternoon. Wonder what the main focus will be this year. Rohit kicked of Wednesday morning with a real show. Entered the scene to the Mission Impossible Theme Song and started telling us a story of mission to solve and how IIG technology could fit to these missions. Rohit means that the reason we are all here today is that we believe in business transformation and that information is at the core. Talks about the persona ”Sonia” – she values choice and flexibility. On the other side is reqmts on compliance and governance. Rohit: ”To be love you have to be lovable, to be consumed you have to be consumable”. There is a consumability gap that needs to be addressed. I think it is clever to connect solutions IIG can deliver to concrete examples but explain how info mgmt relates to solving problems in the examples.